Writer’s Cramp – oops, Camp! It’s been a busy few weeks for writers. The weather, all rainy and a little bit misty and the wind blowing with a colder breath – all good stuff for writing it seems. I’ve started my new novel, I think. I’m never sure until the hairs on my arms go all prickly and I feel wickedly excited by the way the words are falling on the page – or the screen as it happens at this stage. I’ve already done the notebook stuff with arrows and maps of the way my characters will move together. Its going to be a ghost story – and its going to feature Oliver Briskett, the detective dog who has already appeared in Grave Catastrophe. I’m liking it so far but I had to talk about it with a friend to really get it going. I had all the ingredients and all the ideas happening but sometimes I need someone else to help me find the key that will unlock the way into the story. In this case it was my good mate Brian who works with Children’s literature – it took a while but he finally asked the question that made me think of the answer that led me to the key. I’ve been busy working away in schools again and my last school was at Rochedale in Queensland. What a great place – all bushy and snuggled up close to Brisbane. And what great writers I met there. Everyone keen and busy and full of ideas and ways to get stories happening. They’d already had one day with Simon Higgins who’d shown everyone how to unlock some great stuff – I was green with envy at some of the lovely sentences that were produced. My day was about stringing the story together and we did heaps. One of the nice things about writers is the way the go off on a tangent and produce something unexpected. Kiarna produced the poem that she sent to me – it was a surprise and I could see that she was completely caught up with her images. You’ll love it – have a read. One of the ways that you can publish your work – and the work that was being produced at Rochedale would certainly suit publication – is to send a copy of your best work to ‘Oz Kids In Print’ – check out their website www.ozkids.com.au for all the details. I have a new family of wrens in my yard this week – all happily searching out nibblies in the wet grass. There’s also a bush turkey – they perch in the trees like some overgrown, evil budgerigar, waiting until I go inside and then they swoop down and dig up the herbs. Grrrrr….down with turkeys! And some bad news – Kiana’s poem that was happily sitting on my desktop was just eaten by the delete button. Kiana is going to send it through again, I hope … can’t believe that it happened so quickly but I guess the lesson is: ALWAYS SAVE A COPY!!!!!! Eeeeeeek (sorry Kiana). Till next time when the poem will be here and I will be able to lift my head from the shame of sending a lovely poem to the place of deleted objects (they probably all sit around like odd socks waiting for someone to claim then). Okay – so I didn’t win but it was a great dinner with lots of really interesting people all over the place so I didn’t really mind. I was able to spend some time walking around the Art Gallery of NSW at night looking at the Archibald Prize Entrants and being very, very impressed. Dinner was served after we’d finished looking about – it was magic having the Gallery and all those portraits looking down at us. I’m sure there’s a story in an Art Gallery for me – I did start one when I visited the Musee D’Orsay in Paris. It wasn’t all the paintings and famous, famous names of artists that got me going – it was the waiter in the Restaurant upstairs. It was this marvellous place with a giant clock on one wall – we were sitting behind the clock having our coffee and cake and watching the hands go around when I noticed the waiter. He had on the whitest shirt and swished around flapping a tea-towel (I’m sure it wasn’t a tea-towel – probaly has a special name or something but it looked like a tea-towel to me). He was mostly rousing on the other staff and hurrying people into the seats. We were all rushed about and it was a bit of a battle not to gobble the cake and gulp the coffee so we didn’t clutter up the place. We managed though – and while I watched him (and the hands of the clock) I began to wonder what might happen if a little mouse lived in the pocket of a guard and at night he was able to come and the crumbs in the restaurant. I began to think that this waiter would be a mouse’s worst enemy – and the guard (and I’d already called him Guilliame) would be his best friend. And it would be well until Guilliame gets the sack…mmmm, what future then for a small, inconsequential mouse….maybe I’ll get back to that story. I met some beaut kids at A.B. Paterson College. They were very keen and we laughed our heads off about me and my newest addition (more about that in a minute). We wrote stories together and solved problems. I love it when everyone giggles together – seems like the whole world needs a good laugh sometimes, don’t you reckon? I didn’t intend to write about art gallery story making. I was intending to write about the lovely rain and colder days and grey skies and how its just brilliant being warm and snug inside. Its a time when I worry about people who aren’t as lucky as I am – I do the little bits I can to try and change that situation – mostly I fill bags with clothes and books but I’m thinking I’d like to get involved with some of the knitters who make squares and then turn them into warm rugs. The good news about grey skies, for this writer anyway, is that it seems to free up my imagination and my fingers twitch to start getting into some new work. I have started playing with a new idea this week – its another novel about Oliver Briskett, the seeing-eye private detective dog who solved the murder of Thomas A Gentle. This time I’m thinking he might have to help solve the mystery of the Missing Baby. Her name is L’il Chloe and she’s toddled off- well, maybe….or she might have been kidnapped…I’m still working on this….I’m a bit worried about who might kidnap her, and for why…is she rich, special, have super powers…what what what?? And, finally, I want you to meet my newest addition. He looks like a miniature Doberman (black and tan) so his name is Bonsai. 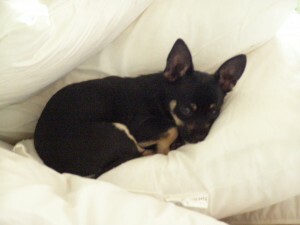 He’s a tea-cup Chihuahua – he really is although he’s more coffee mug size now. My daughter sent him to me as he had no home – he landed via Qantas in a giant crate…such a wee, small thing in the corner. We loved each other straight away – he sleeps on my bed and chews my old dog, Noelene…and she loves it! They play chasing up and down the hall and generally have a fabulous time. If you want to see Noelene and Timon (the other Maltese) have a look in ‘Grave Catastrophe’ – they’re the Maltese whose names are Block and Tackle. That’s all for this week. Have a wonderful winter. Snuggle down and, if you feel like it, try and get onto the knit a square thing. And then there’s the MS Readathon – are you doing it? I’m going to have a quiz night at my house..Oh, and just one last thing – had a great time at Mater Dei in Ashmore the other day. We made up stories about bears and kids fallin off cliffs and dogs who have no home. Brilliant. Smile at someone close to you – they’ll either smile back (good) or think your nuts (better)!